From SF Gate: Dreaming of greener (read: cheaper) pastures? You’re not alone. According to a new survey by Edelman Intelligence, 53 percent of Californians are considering moving out of state due to the high cost of living. Millennials are even more likely to flee the Golden State — 63 percent of them said they want to. Bay Area residents surveyed were especially sensitive to affordability issues, and it’s no surprise. The median home value in San Francisco is $1.37 million, according to Zillow, and $1.09 million in San Jose. In Edelman’s survey, 76 percent of Bay Area residents say they consider cost and availability of housing to be a serious issue. Sixty-two percent also call homelessness a very serious issue for California. It appears the housing and homelessness crises have led to a pessimistic outlook: 62 percent of those surveyed say the best days of living in California are behind them. The trend is backed up by much of SFGATE’s past reporting. We’ve spoken with people who’ve left California for the Pacific Northwest, Texas and Denver — all popular destinations for Bay Area ex-pats. Nearly everyone we talked to cites the high cost of living as the primary reason they left. Others were looking for a slower pace of life, lower taxes, less traffic and more time with family. The Bay Area was also found to be leading the nation in outward migration, meaning more people are leaving the region than moving in. However, most people who moved out of the Bay Area didn’t go too far; the number one destination was Sacramento, followed by Los Angeles, Seattle, Portland and San Diego. 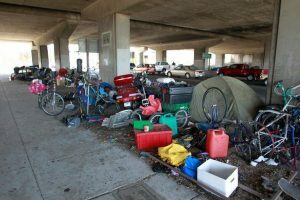 The goal is to end the situation with homeless people living tents all around downtown Olympia by moving them to a designated area. The number of homeless people living in tents has skyrocketed from about three dozen to well over three hundred in the last three months. Some say it’s gotten out of control, but the city said it’s working to make changes. The first mitigation site will be at Olympia Ave. NE and Franklin St. NE, which is a current homeless camp. It’ll be a first-come, first-serve site, fitting 80 people. Each person gets a 10-by-10-foot spot and a tent. DeForrest said it’ll be fenced with bathrooms, running water and trash cans. City officials said they’re spending about $100,000 to make changes and build the site. Construction begins the week of Dec. 3 and there is expected to be more than one mitigation site in the future. 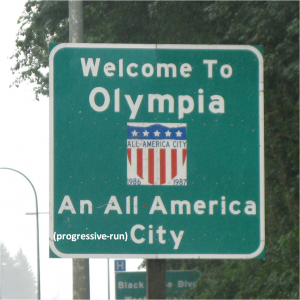 Olympia, like many other cities, has struggled to deal with the issue ever since a court ruling said arresting people for camping in public areas is cruel and unusual punishment especially if there is not shelter available for them.